I’m sharing some examples that focus on channel admins and moderators. If it looks like I am cherry picking examples from these people, it is because I am (full disclosure). Admins, moderators and special rank members need to stop doing these things, not engaging in it. Admins and Moderators are setting an example and others follow their lead to fit in. Let’s start with some examples from just this week, from an admin in the Demon Hunter Discord – The Fel Hammer. The “Regulars,” aka the ‘in crowd’ consist of a very small group of people who make up about 75% of the chatter in a channel. Some of them use no shortage of these slurs too – again, even to random people dropping in to ask questions. That user had asked several questions over the previous couple of weeks. He hasn’t asked a question since. Unfortunately, it is very common to attack ‘other’ podcasters, youtubers, guidewriters, and anyone who has put themselves out there in an effort to help players. Even when they aren’t using toxic slurs to do it, it is a giant problem. Have you ever wondered why it seems there are less and less viewpoints out there? Because if you disagree, you are a target. The second example here, from Tankchat, shows how this toxicity crosses channels. 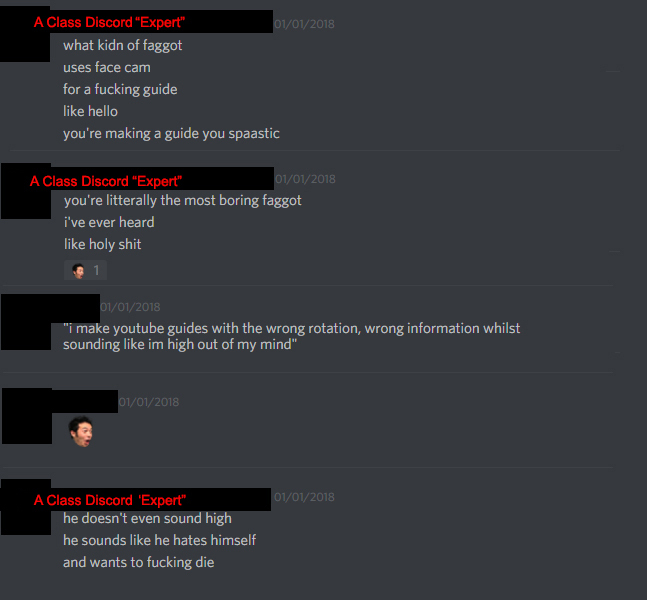 This is an expert in another class Discord, but he is heavily moderated in that channel. He doesn’t have to behave in other ones though – which is quite common from this small group of toxic people. Instead of addressing the toxicity, some of the people responsible for it turned it back onto me personally, or on to AMR. It’s a common misdirection tactic to change the subject and evade any discussion to fix the issue. Meanwhile, this same person continuously says racist things in several different channels. 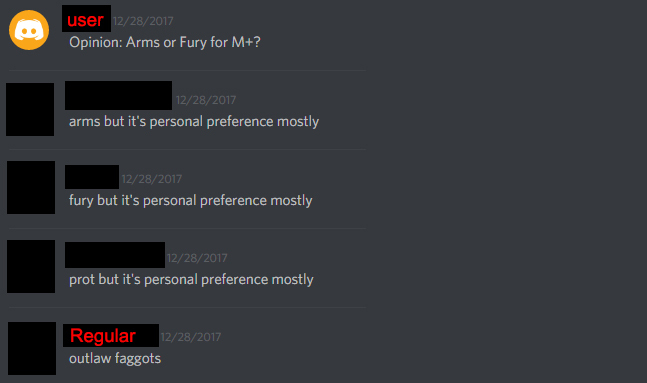 Here’s an example from Tankchat, a very toxic Discord channel, which he participates in. He is labeled as ‘misdirector’ in the screenshot below. Instead of addressing the problem of constant racist and homophobic remarks, and the impact on the community, there is a group of people who participate in this that shrug it off as joking. 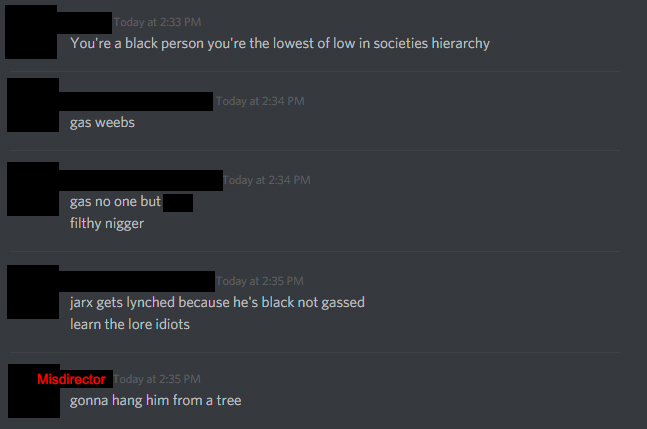 They’ll argue that this is ok because it’s a ‘known’ toxic Discord. Then they turn around and try to paint anyone calling them out for this behavior as the ‘bad guy’ trying to ‘censor’ free speech. This behavior spreads and if it spreads enough it becomes normal. But a lot of people are addressing it, from other Discord moderators to giant gaming companies. As a recent example, an official Overwatch player used a homophobic slur after a match. Blizzard suspended him and fined him $2,000. These players are also big streamers and the director of Twitch.tv (djWHEAT) acknowledged this problem as well. Jan 20, 2018: Dallas Fuel Team player for Overwatch was fined and benched for homophobic slurs. Feb 8, 2018: Twitch decided to take an even stronger stance against this problem. For a while now, Twitch has been pretty proactive in making sure Twitch streamers are following the community guidelines. However, they found that in order to not get banned on Twitch, they’d take the harassment to other social media. That lead to Twitch’s latest policy: if a streamer is harassing other people across other platforms (like Twitter), that is cause for punishment on the Twitch platform. March 9, 2018: Dallas Fuel Team player for Overwatch fined again, for racist slurs. March 21, 2018: A full day toxicity summit was held at the GDC (Game Developer Conference). The Fair Play Alliance is launching as a cooperative effort among 30 different gaming companies to address this problem. March 24: Overwatch releases “Avoid as Teammate” feature to PTR, which lets you block people from the matchmaking system for toxicity. April 17: Heroes of the Storm is turning to a tech solution that helps them ‘silence’ consistently abusive players. This comment on Reddit (which addresses this article), brings up an interesting question. What do we do with the knowledgeable player who contributes to these Discords, but does so in a toxic way? I’m willing to bet that a toxic person will continue to contribute, even if moderated. It only gets out of control if we let them, or if they happen to be the moderators and admins. I believe that as a community, we can solve this problem without preventing anyone from contributing. Want to try out one of the class Discords? Like I’ve said, not all of them are toxic (most aren’t). Some of them have really great moderation and really good discussions. Each channel within the class Discords have their own moderation team, and team of experts.